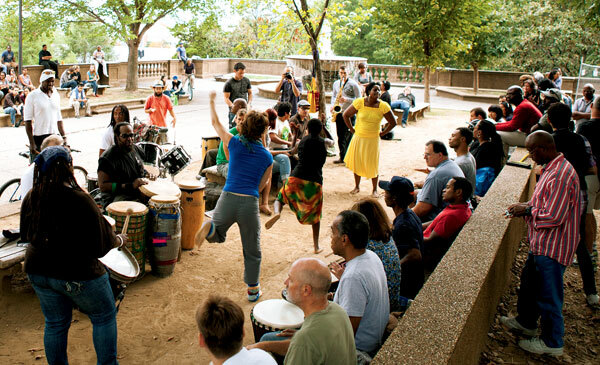 The drum circle in Meridian Hill Park is an institution. The weekly participants trace their lineage to the 1960s Civil Rights protests, an era when activist Stokely Carmichael dubbed the space Malcolm X Park which still serves as an unofficial moniker. However, what struck me on my first visit was not a militant activism but rather the apparent openness and participatory nature through which the drum circle evolved. For all my attempts not to oversimplify music, the medium does have certain qualities which transcend engrained stereotypes and surface differences. Music, while not a universal language, is universal form of expression. The circle doesn’t wave a wand of equality, but instead allows for problems to work out organically without the haze of drugs and alcohol or the distraction of money. I would argue these two factors, more than almost anything, cloud a perfectly good person’s judgement. Participatory music is a funny thing. A cursory look from a passerby might see the circle as wholly welcoming, but it’s clear the dynamics are more complex. I heard you’re supposed to “register” your drum with William H. Taft, a drummer who has been participating since 1972 and the circle’s current sponsor. Despite this, I saw plenty of other new folks walk in and begin to play. No one wants to ruin someone’s good time. Since I’m a fan of minimalist music, I found the polyrhythms seductively visceral. I was lulled into a trance after only a few minuets near the circle’s center. The drummers seemed especially enthusiastic with the beautiful late fall day. I know I’ll be back. But first I need more time to ruminate on the circle’s community impact. DC residents surely know this is a unique institution that will hopefully continue for as long as its peaceful mission is needed. To paraphrase a mantra from The Field of Dreams, if you play it, they will drum. This entry was posted in Issues, Miscellany, Shows and tagged ethnomusicology, live music, participation, protest music. Bookmark the permalink.